It reads like an Italian comedy script: a dialogue between two hustlers is going on, and one says to the other “I have an idea that’ll make us some dough. It’s your turn to get your hands dirty”. It’s almost comedic that this is what happened between Bruno Vitaletti and Sabatino Paoletti. With twenty years age difference, the two got to know each other when their paths crossed in their town of Sassoferrato, in the Marche, a small place where everyone knows everyone. Bruno was born in 1951 and studied engineering in Bologna. Upon graduation, he began to work in construction. In 1990 his work brought him to Russia for some years. It was there that he saw with his own eyes how and where grain was cultivated; the same grain that was imported by Italy to make pasta. He realized that care for nature and for the final product was non-existent, as these wheat fields were often found in highly polluted areas. His immediate reaction was not to eat any more pasta, followed by years of thought and reflection about the agricultural food production system and the importance of the raw material for a final product. Meanwhile Sabatino, born in 1971, was a land surveyor who worked for various organizations as an organic farming inspector. Destiny brought Bruno and Sabatino together in 2009 when they casually met in Sassoferrato. Engaging in conversation, Bruno told Sabatino exactly what he saw with his own eyes regarding wheat cultivation. It was this moment that sparked the Italian-comedy-scene; Bruno suggested to Sabatino that they should “get their hands dirty” and “make some dough” – both literally and figuratively. Sabatino hesitated at first, knowing the difficulties of farming organically. They did both agree that it would be hard work, and acknowledged that the final result was not enough – the choice of the variety of grain was of vital importance. The idea to look for an ancient grain variety with low gluten content was born from the fact that Sabatino’s younger son, Mirco, is gluten intolerant. Using such a grain allows almost everyone to eat a good quality pasta. In the province of Pescara, they traced Saragolla, an ancient grain variety from the Khorasan wheat family. This durum wheat is difficult to grow and especially to make pasta, but otherwise, it has all the right credentials they were looking for: it is not a hybrid, it is rich in protein, amino acids, vitamins and minerals, low in gluten and with a simpler gluten structure than those of common grains. All of these factors result in lengthy and costly steps during the pasta making phase, but for them, it’s all worth it. Bruno and Sabatino planted the Saragolla in some plots of land in the surrounding area of Sassoferrato. 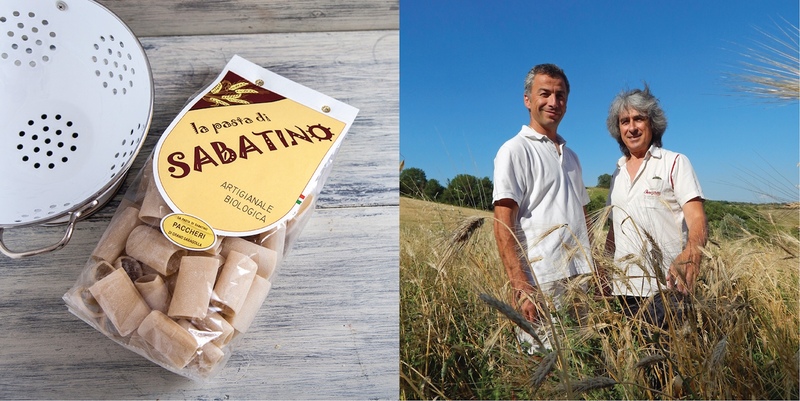 The wheat grew easily thanks both to the experience of Sabatino and to the geographical position of the land, which is protected by the Apennine Mountains and just 50 km from the sea. From 2010 to 2013, with the collaboration of the Miglianico Pescara pasta factory, the two wanna-be pasta makers made progressive attempts at producing pasta. Their one restriction was that their pasta would consist only of two ingredients: Saragolla wheat and water, zero additives. This was quite the challenge. However, with any challenge there is a desire to succeed. Vitaletti and Paoletti see success not only in making a low gluten quality pasta, but especially in the fact that their consumers want their pasta on a repeat basis. So how can this pasta be found – what is it called? As a tribute to his young friend, Bruno suggested to call this pasta ‘Sabatino’. It is easy to say what a beautiful job this work is, but Bruno and Sabatino consider their company too small to be called effectively ‘work’. More appropriately, they call it a hobby still, as they produce low volumes. This ‘work’, however, remains all-encompassing and rewarding, just as any passion is. Their dedication results in satisfaction, also on a small and daily basis: Sabatino still gets emotional whenever he sees his son Mirco happily eat his father’s pasta without any difficulty. Sabatino is satisfied knowing that they produce a quality product that (almost) everyone can enjoy.